It’s potato latkes for Thanksgiving this year, and not only because it’s Hanukah…but because they’re really good. 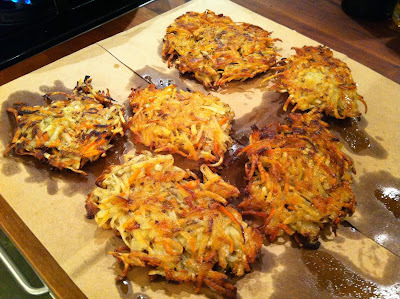 While they’re is nothing like a crispy latke right out of the hot oil, because of the logistics of putting out a huge holiday meal it is possible to fry them beforehand and reheat uncovered in the oven before serving. Start by heating up a quarter inch of vegetable oil in a heavy skillet before peeling six baking potatoes, enough for 20 latkes. Using a hand grater or Cuisinart coarsely grate the potatoes along with an onion and carrot before stirring together with a third of a cup of flour, three lightly scrambled eggs, a tablespoon of salt, and teaspoon of black pepper. When your oil is hot take a quarter cup of the mixture with a slotted spoon and squeeze out as much water as you can using the palm of your hand before sliding the flattened mixture into the oil. Cook two to three minutes per side until golden brown then transfer to a paper bag to drain. Serve with sour cream. And one more thing, don’t forget to turn your exhaust fan on high.